Germany responded well from their World Cup nightmares as Die Mannschaft held out World Cup winners Les Blues in a goalless Nations League Group A draw at the Allianz Arena. 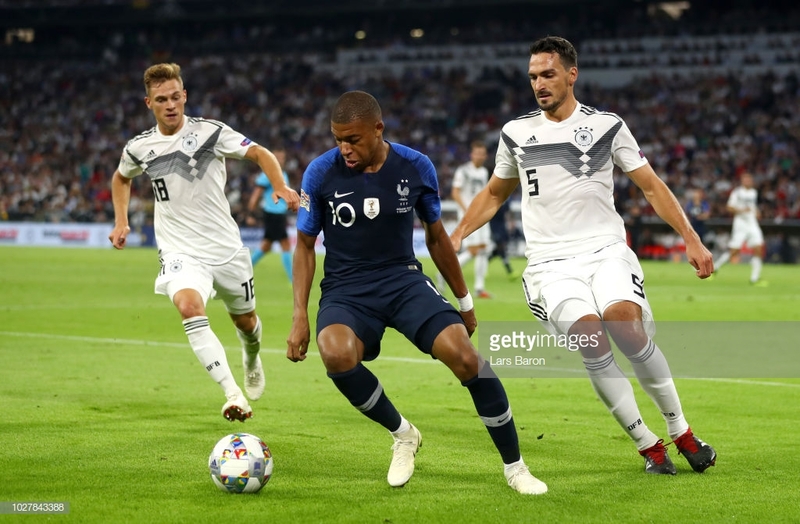 World Cup champions France held out for a goalless draw against a much rejuvenated Germany side who lifted their summer woes to hold out Didier Deschamps world champions to a goalless draw in their opening UEFA Nations League match. Alphonse Areola was the standout player on his France debut as the PSG goalkeeper was impregnable to deny the hosts victory following a number of terrific saves to keep Joachim Low's side at bay. Deschamps' national heroes were in competitive action for the first time since their World Cup triumph in Russia this summer, whilst the German hosts were playing with a point to prove. The 2014 World Cup winners were humiliated in Russia with the four-time champions eliminated at the group stages; however, Lowe's side showed character to deliver a positive performance following their summer horror show. The hosts looked confident with the ball on the night but lacked that final killer instinct as the visiting world champions defended well in numbers before looking to counter - a tactic that won them their second world-title in Russia. An early clash between Benjamin Pavard and Antonio Rudiger certainly reaffirmed this famous rivalry would not be lacking it's traditional fiery edge early on. The Chelsea defender came storming down the left flank in his unusual full-back position, but the 25-year-old defender was determined to get past World Cup winner Pavard who made a clever challenge before receiving a blow to his face as Rudiger unintentionally left his studs in a little to late causing the Stuttgart right back to go down early. The game quickly settled and Germany predictably dominated the ball as hosts early on and settled well into the affair. As for France, the visitors similarly as they showed at the World Cup were comfortable seeing little of the ball and waiting for the opportunity to fly forward and punish the hosts. Lucas Hernández proved an early menace for Die Mannschaft, constantly patrolling down the left flank showing great strength to bulldoze through Timo Werner on more than one occasion. This fierce encounter lacked quality in the final third with both sides defending emphatically but failing to create any real cut chances. This was summarised when Jerome Boateng's lovely cross-field ball found Werner, and the RB Leipzig forward cut inside to shoot but failed to test France debutant Areola. Teenage mutant Kylian Mbappe was enjoying the similar freedom he saw in the World Cup when the French forward took a looping ball out of the sky with a bouncing backheel killing the ball dead before the forward looked to find Antoine Griezmann with a teasing ball. It didn't quite come off, but it was a fantastic bit of skill. A half-chance for the hosts came from a Toni Kroos corner when the Real Madrid midfielders cross was headed on by Rudiger towards the back post, it fell to Mats Hummels and the 6ft 4 inch centre-back looped his header over the bar. The 31-year-old striker forced Germany captain Manuel Neuer into a sprawling save with a testing header before his effort from an acute angle rolled across goal on the stroke of half-time. France looked to assert dominance in the second period and they came close when Greizmein fizzled a shot towards goal but Neuer stood firm to deny. The floodgates came calling as Les Blues continued opening up this German defence - Griezmann very nearly played in Giroud, but the pass deflected away from the path of the former Arsenal striker - he would have been clean through if that had fallen kindly. N'Golo Kanté was once again an impenetrable force in the middle of the park and was running the show for France - he made two superb interceptions in the opening 15 to turn over possession into potential French counters. The 2016 and 2017 Premier League winner was orchestrating every Blues attack as the heartbeat - and the lungs - of this World Cup-winning side. Mbappe once again lit up the stadium just as he has consistently lit the world with his tenacious skill and outrageous pace as he tormented German defenders to set up more French attacks. Griezmann came close again when he launched a rocket from range, the Atlético Madrid forward thundered an effort towards Neuer but he did well to beat the shot away. The German home crowd held their collective breath when Mbappe raced away onto a loose Greizmann ball at lightning speed in on goal leaving everyone around him in his dust. However, the French youngster snatched at a low shot and dragged his effort well wide from 20 yards out to let off a relieved German back-line. The hosts grew into the game and began to threaten themselves when a surreal 10 seconds for the home crowd saw Marco Reus play a lovely ball on the overlap for Hummels of all people. The centre-back isn't known for his darting forward runs but the Bayern Munich defender played a delicious cross from Muller - his fellow Bayern forward - who inexplicably decided not to head at goal before opting to volley, his effort was blocked but fell kindly for Hummels, who shattered a volley at goal but Areola did well to parry for a corner. Germany defender Mathias Ginter came so close to breaking the deadlock from a corner when his header flew towards the far post, but Areola was there once again to stretch to his right and keep the ball out demonstrating stunning reflexes to keep his side in the match. France held on for a UEFA Nations League opening draw thanks to their keeper, but this was a match of the highest quality that saw two teams battle it out for a deserved point both ways.